Before he was the engaging professor who brought mythology into people’s living rooms through his conversations with Bill Moyers, before he became known as the thinker whose ideas influenced Star Wars, and before his now-beloved phrase “follow your bliss” entered the popular lexicon, Joseph Campbell was a young man who tried his hand at writing fiction. At the age of twenty-nine, after years of Depression-era unemployment, when he lived off money he had earned playing saxophone in a jazz combo and read the world’s great literature in a syllabus of his own design, Campbell published his first short story, “Strictly Platonic.” That tale remained the famed mythologist’s only published piece of fiction, until now. 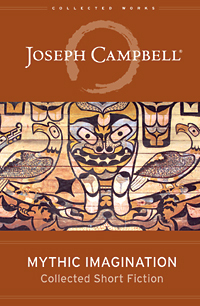 We are pleased to announce the recent publication of Mythic Imagination: Collected Short Fiction by Joseph Campbell. In these stories, readers will find rich mythological symbolism, down-to-earth concerns with the ravages of the Second World War, and singular iterations of Campbell’s famous Hero’s Journey schema — all interwoven into a literary style that anticipates the genre that would years later come to be known as “magical realism.” Compelling in their own right, these seven stories (which include “Strictly Platonic”) are essential reading for longtime Campbell fans and the many who continue to discover him afresh. In what new ways will you “follow your bliss” in 2013? Be sure to adjust your settings so we can see your email address or leave it in the comments section. Good luck!